Review by AllTheBestFights.com: 2015-12-12, pretty good finish between Kevin Mitchell and Ismael Barroso but it is not enough to get three stars: it gets two. Kevin Mitchell entered this fight with a pro record of 39-3-0 (29 knockouts) and he is ranked as the No.19 lightweight in the world while his opponent, the undefeated Ismael Barroso, has a boxing record of 18-0-2 (17 KOs=94%) and he entered as the No.65 in the same weight class. 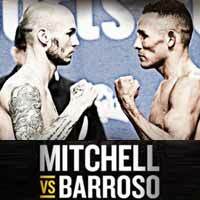 Both boxers have fought twice in 2015: Mitchell has beat Daniel Estrada (=Mitchell vs Estrada) but then he has lost to Jorge Linares (=Mitchell vs Linares) while Barroso has won over Issouf Kinda and Ira Terry. Mitchell vs Barroso is valid for the interim WBA World lightweight title; undercard of Anthony Joshua vs Dillian Whyte. Watch the video and rate this fight! Review by AllTheBestFights.com: 2015-05-30, Kevin Mitchell vs Jorge Linares gets three stars thanks to a good second part of the fight. Kevin Mitchell entered this fight with a pro boxing record of 39-2-0 (29 knockouts) and he is ranked as the No.4 lightweight in the world (currently the #1 in this division is Mickey Bey). He suffered his last defeat in 2012 when he faced Ricky Burns for the Wbo Lw belt (=Burns vs Mitchell), since then he has won six consecutive fights beating Daniel Estrada in his last bout (=Mitchell vs Estrada). His opponent, the former Wbc featherweight and super-Fw world champion Jorge Linares, has a record of 38-3-0 (25 knockouts) and he entered as the No.8 in the same weight class. He suffered two consecutive losses between 2011 and 2012, against Antonio DeMarco (=DeMarco vs Linares) and Sergio Thompson (=Linares vs Thompson), but since then he has collected seven victories winning the vacant Wbc Lw belt in his last fight, against Javier Prieto (=Linares vs Prieto). Mitchell vs Linares is valid for the WBC World lightweight title (Linares’ first defense); undercard of Kell Brook vs Frankie Gavin. Watch the video and rate this fight! Review by AllTheBestFights.com: 2015-01-31, very nice and tough fight between Kevin Mitchell and Daniel Estrada: it is close to get four stars. 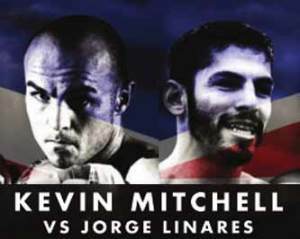 Kevin Mitchell entered this fight with a pro boxing record of 38-2-0 (28 knockouts) and he is ranked as the No.9 lightweight in the world, he suffered his last defeat in 2012 when he faced Ricky Burns (=Burns vs Mitchell), since then he has won five consecutive bouts, the last one against Ghislain Maduma (=Mitchell vs Maduma). His opponent, Daniel Estrada, has a record of 32-3-1 (24 KOs=75%) and he entered as the No.52 in the same weight class, he fought just once in 2014 losing to the undefeated Omar Figueroa (the fight was valid for the Wbc Lw title, Figueroa vs Estrada). Mitchell vs Estrada is valid for the vacant WBC Silver lightweight title. Watch the video and rate this fight! Review: 2014-05-31, disappointing and pretty boring fight between Kevin Mitchell and Ghislain Maduma: it gets one star. Kevin Mitchell entered this fight with a boxing record of 37-2-0 (27 knockouts) and he is ranked as the No.29 lightweight in the world, he had two world title-shots in his professional career but he lost both fights: against Michael Katsidis in 2010 (five-stars-fight Katsidis vs Mitchell) and Ricky Burns in 2012 (=Burns vs Mitchell); after this fight he has fought and won four times. His opponent, the undefeated Ghislain Maduma, has a perfect record of 16-0-0 (10 knockouts) and he entered as the No.27 in the same weight class, he has already fought in 2014 successfully defending the NABF Lw title against John Carlo Aparicio, title that he had won in his last bout of 2013 against Fermin De los Santos (=Maduma vs De los Santos). Mitchell vs Maduma is on the undercard of Carl Froch vs George Groves 2. Watch the video and rate this fight! Review: 2013-12-14, pretty good finish but the rest of the fight was quite boring: Kevin Mitchell vs Karim El Ouazghari gets two stars. Kevin Mitchell ranked as the No.14 lightweight in the world, entered the fight with a record of 35-2-0 (25 knockouts) while Karim El Ouazghari had a record of 14-3-2 (4 knockouts). Mitchell vs El Ouazghari is valid for the IBF Inter-Continental lightweight title; undercard of Leonard Bundu vs Lee Purdy. Watch the video! Review: 2012-09-22, great stars and great fight between Ricky Burns and Kevin Mitchell: three stars. Ricky Burns (34-2-0) entered as the No.4 lightweight in the world while Kevin Mitchell (33-1-0) entered as the No.7. 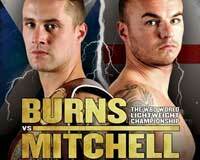 Burns vs Mitchell is valid for the WBO lightweight title (Burns’ second defense). Watch the video! Review: 2010-05-15, Michael Katsidis (26-2-0) had lost his interim WBO lightweight title against Joel Casamayor in 2008 (one of the best fights of the year) but regained it in 2009 (versus Vicente Escobedo); after six months his new opponent was the undefeated Kevin Mitchell (31-0-0) that wanted to win a world title in front of his fans, at the Upton Park in London. 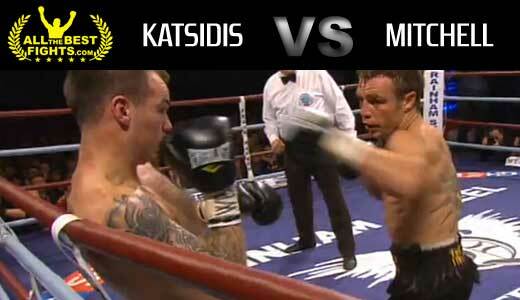 The aggressive Michael Katsidis was the underdog but he managed to defeat Kevin Mitchell in just three rounds: one of the best fights of 2010. Watch the video! Review: 2011-07-16, great fight with a good pace between John Murray and Kevin Mitchell. In the eighth round Kevin Mitchell knocked down John Murray and after a few seconds the referee stopped the fight: TKO victory for Mitchell that won the vacant WBO Inter-Continental lightweight title. Watch the video!